Jai West plays Mak, a mysterious driver and worker, in The People Garden alongside Pamela Anderson. The People Garden is a new film from director Nadia Litz that stars Dree Hemingway, Pamela Anderson, and Japanese Canadian Jai West. Sweetpea (Hemingway) goes to Japan in order to break up with Jamie, her rock star boyfriend, only to find that he’s gone missing in a mysterious forest while shooting a music video. Mak (West) is sent to pick Sweetpea up from the airport, but the role he plays in the unfolding mystery goes a little deeper than a disappearing rock star. The forest that surrounds the character is strange yet serene at once being filled with too much life and then none at all. And the Japanese men who work there know something that they aren’t talking about, and Sweetpea sees Mak as a bridge she can use to track down Jamie. We had a chance to speak with Jai West about his role in the film and his work as an actor who plays characters on both sides of the Pacific. Nikkei Voice: How did you get involved in People Garden? Jai West: With People Garden, there was a casting director in Tokyo named Georgina Pope. She’s Australian, but one of the biggest casting directors for any projects that come to Japan. She’s always been getting me good auditions and she’s taken care of me a lot. The project came to me through her and she called me and said, ‘There’s a good project coming up and it’s the perfect job for you.’ I sent in a video audition and I got the role after that. NV: What were your first reactions to the script? The film is pretty enigmatic even for a mystery film. JW: When I first read the script, I enjoyed the mystery aspects to it, but it seemed a little bit more feel good. It had a happier ending and it had a lighter tone even if it had a heavy subject matter. I was excited, firstly as an actor, for my part because I like that he’s the bridge between two cultures, two worlds. It also gave me a chance to play with a character who could be a little mysterious. You don’t know if he’s good or bad. He has hidden layers and I liked that. NV: Tell me a little more about Mak’s character and the direction you took him in? JW: I had been wanting to play a part like this for a while and I had been waiting for something like this to come around the corner. I wanted to portray the inner Japanese soul in an English-speaking character. I’ve been doing the opposite in Japan for a long time. Playing Japanese speaking parts, but on the inside of me was a Canadian. It’s about losing someone too in People Garden and I wanted to do things that could display the spirituality and enigmatic nature of the forest in the Japan where the film was shot. I had personally gone through the same experience as Mak, so I was basically channeling that experience. I was trying to think about that as often as I could. NV: When you have a film set in Japan and you get a character picked up by a character like Mak an at airport, you expect him, even if he speaks English, to have a bit of an accent, but he doesn’t. You’ve also done quite a bit of acting in Japan including being on Japanese television, was it different to play a character who can speak both languages fluently? JW: That was something I had questions about and in the initial audition tape I had done it with accented English. I’ve worked really hard in Japan to be seen as a Japanese actor. I’ve worked really hard on my intonation in Japanese and I’ve been a stickler for that. I want to be as real as possible, but when I met the director, Nadia Litz, she explained to me that Mak is Japanese, but he doesn’t belong there. He may be Canadian and came to Japan, fell in love, lost his way, and stayed there. That was the direction I got. Nadia, the director, she has a long-term partner who is Polish Canadian and he did what I did. He grew up in Toronto, then moved to Poland, but he’s never really felt at home. He doesn’t feel Canadian in Canada and he doesn’t feel Polish in Poland. She told me his story and said that Mak has a part of him that feels that way as well, and I can relate to that. NV: Tell me a little bit about your reaction to the first cut of the film? JW: I’m happy that I felt something at the end. I felt an emotional resonance. The last scene in the movie we shot three times. Once we shot it on Vancouver Island, Sudbury, and in Tokyo. I was getting a little worried by the third time because I thought I was doing something wrong, but I felt like it was the last scene and all this emotion had to come out I might have been putting too much pressure on myself. I tried to do a lot without doing too much with my face. The director kept saying we were going to do it over, but coincidentally I listening to a podcast about silent film history on my way to Japan. There was a young actress who had a scene that was a close up of her face that was going back to Europe from New York, but she couldn’t get it. The director told her, ‘Just think about what you had for breakfast this morning.’ And it was used in the movie. She didn’t act, she jut thought about breakfast. The justification of it was that she had done such a good job acting, but in the last film she just had to be neutral. It was an editing moment. It was a montage moment. And it ended up that the last scene was the third time in Japan. I was more relaxed and being just as neutral as possible, so it worked out. NV: During the film you also worked with Denis Akiyama and you two are part of only a handful of Japanese Canadian actors, what was it like for you two to work together? JW: I love Denis Akiyama, I love him as a human being and I love him as a brother. He’s an amazing actor and an amazing human being. He’s definitely a pioneer for Asian Canadian actors and that is for sure. He did Miss Saigon and he was in a tonne of movies, so for me when I was in Vancouver I was a teen actor. I was in a show with Ryan Reynolds and others, and it was a multi-ethnic show, but everyone started to get bigger parts. I was given these really boring auditions and that’s when I was given a chance to go to Japan and met an agent who really believed in me. I told Denis about this, but it was a different route for him. He stayed in Toronto, stayed in Canada and carved out his niche. I’m just super proud of him and respect him. 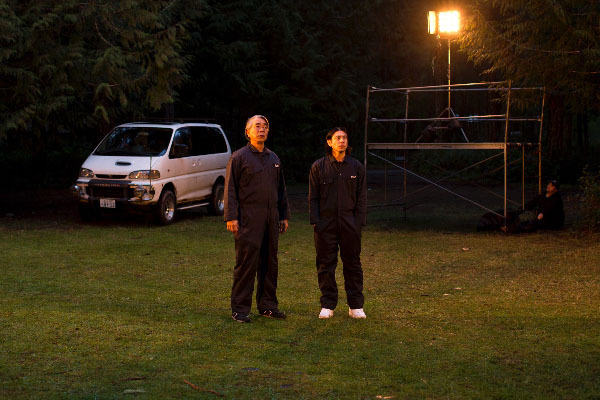 Denis Akiyama, left, and Jai West, right, play leading roles in The Japanese Garden, but the differences between these two Japanese characters becomes apparent from the moment they start to interact. NV: There’s a bit of a dialogue these days about actors who are Asian, but can’t seem to land roles in the film industry. Sometimes these are even roles for Asian characters. With your experiences working in Japan and North America, do you have any experience dealing with this? JW: It’s weird. It’s just weird. I’m half Japanese, so I’m white enough to play a white guy here or Japanese enough to play a Japanese guy over there. It is a weird one, and there’s no answer to it. I try not to think about it. I recently auditions for this HBO show called Girls and they had a two-episode arc in Tokyo. It was a romantic part with one of the lead girls and it was a funny part. I think I was the funniest guy in the room and everyone said, ‘Ok, I think you got it.’ I find out the last second that they had given it to an actor in Japan who is fully Japanese. He nailed the audition and I watched it, but they cut it down because he didn’t nail it perfectly. Their thinking was, we’re an American production in Tokyo we want a Japanese part. Jai’s funny, but his name is Jai West. We’re in exotic Japan. It was more important to them for it to be a Japanese actor. It’s another weird example of not going with a person because of race. It’s hard, but it’s parts like this that come along once in a while that make it all worth it. NV: Tell me a little about what you’re working on next? JW: I just wrapped on a film in Hokkaido, a Japanese and Taiwanese production called My Little Guide Book. A Taiwanese character comes to Japan and meets my character, a Japanese Australian photographer who shoots artists on ice. That’s going to be coming out in the Fall in English, Taiwanese, and Japanese. I’m going to continue looking for projects back and forth, but also looking for work in French. The People Garden is currently playing at TIFF with showings on May 10, 11, and 12. The film’s premiere will at Carlton Cinema on May 13.